Offical artwork of Octorok from The Legend of Zelda: Ocarina of Time. Octoroks (オクタロック, Octorok) are enemies who commonly appear in The Legend of Zelda series. An Octorok as it appears in The Legend of Zelda: Skyward Sword. Octoroks are common enemies in the Zelda games, debuting in the original The Legend of Zelda. Their exact appearance and behavior has varied throughout the series, though they are always octopus-like creatures that attack by shooting rocks, and reflecting their projectiles back at them is a common way to defeat them. 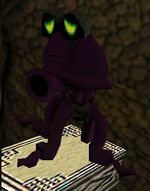 Unusually, while the Ocarina of Time version of Octoroks is the basis of their appearance in Melee, they were only seen in water, and never on land. Octoroks take their appearance from The Legend of Zelda: Ocarina of Time in Melee and Brawl, and from The Legend of Zelda: Skyward Sword in Smash 4. An Octorok in the Underground Maze. Octoroks appear in the Underground Maze stage of Adventure Mode, as well as rarely from Barrels and Crates. Their design is based on appearance in The Legend of Zelda: Ocarina of Time. As the player approaches them, Octoroks start firing rocks which deal damage and knockback depending on the difficulty; while exceedingly weak in lower difficulties, higher difficulties can scale the power of these projectiles to the point that they can potentially KO characters at high damages.. The rocks can be reflected back at the Octorok by simply shielding, and like all other enemies in the game, Octoroks can be defeated by inflicting enough damage to them. For every Octorok a character KOs, 150 points are added to their Octorok KO bonus. These common enemies made their debut in the very first Legend of Zelda game and have been a staple of every game in the series since. They shoot rocks from their mouths at high velocity, but the projectiles are simple to block and do very little damage. Octoroks have low stamina, so they don't pose much of a threat to good fighters. An Octorok appears in Brawl as a sticker. Octorok (left) in Smash Run. Octoroks reappear as enemies in Smash 4's Smash Run, this time using their design from The Legend of Zelda: Skyward Sword. They usually remain hidden beneath a bush, making them invulnerable to all attacks except grabs. When a player approaches, they come out and attack by shooting a rock. Reflecting their rocks back at them will instantly defeat them. 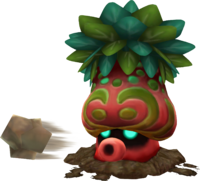 Octorok appears as a Spirit for the game's Spirit mode. This page was last edited on February 12, 2019, at 14:49.